There’s a disconnect between how consumers are reading commercial emails and how marketers are conducting email marketing campaigns. On one hand, there’s the report earlier this week that says 41 percent of all commercial email is opened on mobile devices — a number that’s expected to surpass PC/desktop opens by the end of the year. On the other hand, there’s the new 2013 Email Marketing Benchmark Report from Marketing Sherpa that says more than half of email marketers aren’t designing their emails with mobile devices in mind. 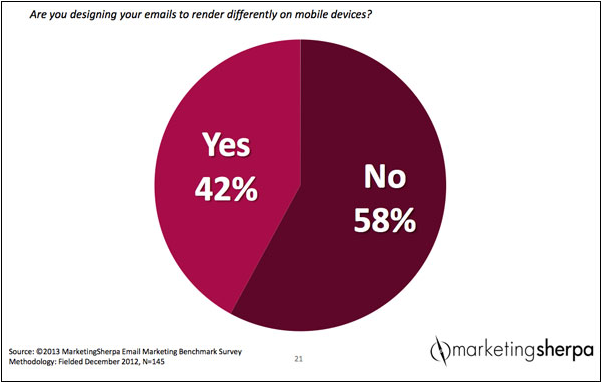 Almost 1,100 marketers took the survey and, of that group, 58 percent said they’re not creating emails to render differently on mobile devices. 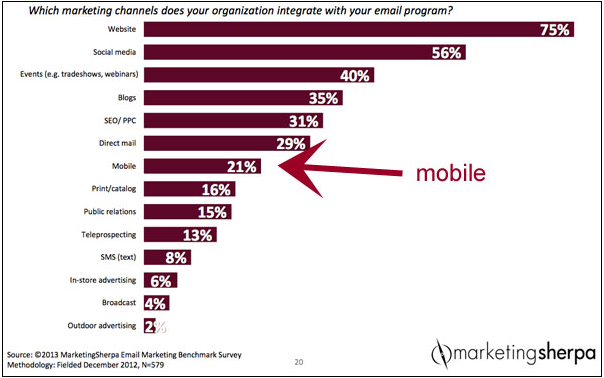 Here’s another sign of the disconnect between email marketing and consumer activity: Only 21 percent of the marketers surveyed say they integrate the mobile channel with their email campaign. Time to wake up Mr. Retailer. Work with your teams now and Get Responsive. You are losing sales to your competitors that are responsive.